In order to rank effectively in Google’s search engine results it is important to ensure that your business information is complete and accurate. The most effective way to accomplish this is to create a Google My Business profile, which puts your business information in front of customers searching on Google. If you would like us to complete this process for you please call us at 1-844-211-9218. If you are a website owner, no, not necessarily. If you have a business, sure, you need a Google My Business listing, but these usually already exist. And no, not doing so will not negatively impact your organic search ranking. 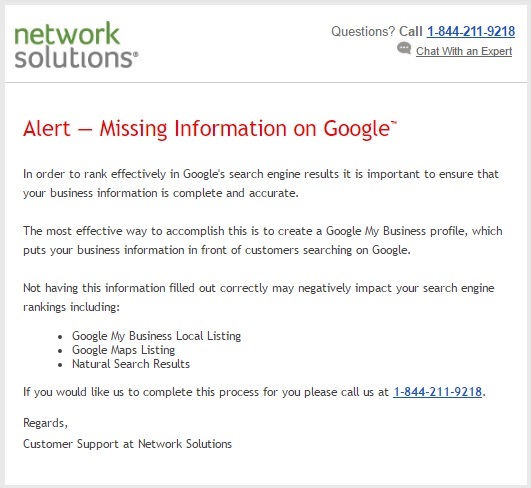 Network Solutions is a registrar. They may offer additional services as well. Registrars only make pennies on domains that people order. To make money, most offer upsells. I haven’t personally looked into what they are selling, but it is almost definitely nothing that is going to “boost” your search engine rankings. And if you need to add your business to Google or claim an existing listing, just go here for the simple, free process https://www.google.com/business/.